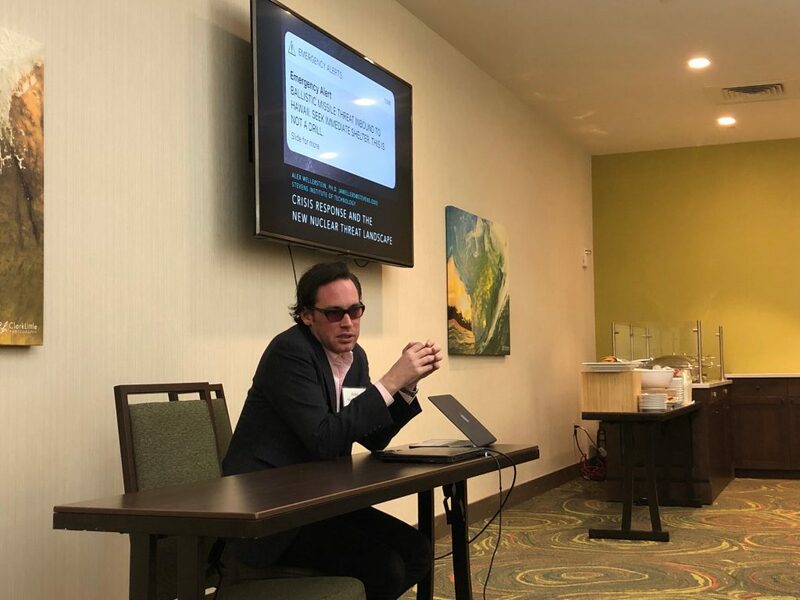 Alex Wellerstein, a professor at the Stevens Institute of Technology and participant at the 2019 Hawaii Journalism Workshop organized by Atomic Reporter and the Stanley Foundation, posted a blog entry after the workshop ended, on January 13th, 2019. I’ve spent the last few days in Hawaii, as part of a workshop hosted by Atomic Reporters and the Stanley Foundation, and sponsored by the Carnegie Corporation of New York, that brought together a few experts (I was one of those) with a large number of journalists (“old” and “new” media alike) to talk about the false alarm and its lessons. Given that it is supposed to be snowing back home, you’d think a trip to Hawaii would come as a very welcome thing for me, but almost all of my time was spent in windowless rooms, and an eleven-hour flight is no picnic.1 So I spent some time wondering, “why have this workshop here?” I mean, obviously the location is relevant, but practically, what would be different if we had held the same meeting in, say, Los Angeles, or Palo Alto? Over the days, the answer became very clear. When you are in Hawaii, everyone has a story about their experience of the false alarm. And they’re all different, and they’re all fascinating. On “the mainland,” as they call us, we got only a very small sampling of experiences from those here in Hawaii, often either put together by people who were interested in being very publicly thoughtful about their feelings (like Cynthia Lazaroff, who we heard a talk from, who wrote up her experience for the Bulletin of the Atomic Scientists), or the kind-of-absurd responses that were used as examples for how ridiculous the whole thing was (e.g., the guy who was trying to put his kids down a manhole). Out here, though, every taxi or Lyft driver has their own experience, along with everyone else. A few of the responses, broadly paraphrased by me (I didn’t record them, and this is not systematic), follow. It is worth remembering that these are coming a year later, and one would expect their memories to be significantly altered by the passage of time, the increased knowledge about what happened, and, of course, the knowledge that, while “NOT A DRILL,” it was a false alarm. This was from a Lyft driver, who looked like she was in her twenties. Hawaii has an extensive emergency management infrastructure for tsunamis. While I went for a long walk early one morning, I passed by one of the sirens for this, and noticed that they still use the same Civil Defense imagery from the 1950s on their equipment. The people of Hawaii know these sirens well, because they test them on the first day of every month. So the Lyft driver’s response was very interesting to me in this respect: she had expectations about what a “real” emergency would be like, and the ballistic missile alert didn’t meet them. This is a response that one journalist, and one policy analyst, both independently gave, almost word for word. In this example, people who felt they were connected to the broader context of the US-North Korea situation, and felt they understood North Korea’s strategic aims and options, reasoned that an actual attack from North Korea was unlikely, and thus discounted the alert. The reasoning behind these “discounting” stories, I might suggest, is terrible. To assume an alert is false because it does not meet your expectations is completely silly unless you are much better informed about what a real alert would look like than our Lyft driver apparently was. Is the ballistic missile system and the tsunami system the same one? Would they use the tsunami alert for a missile alert? Could one system be active and the other sabotaged, malfunctioning, or otherwise not activated? These are big questions! In a real emergency it is not worth betting your life that things aren’t working the way you’d expect them to. And the “context” justification for not believing it is hubris itself. We only see a portion of the total “context” at any one point. Who knows what has happened on the Korean peninsula several hours ago, but hasn’t made it to your ears? If you’re in Pacific Command (or can contact someone there), sure, you might know enough context to discount such an alert. Otherwise, it’s foolish to do so. The fallacy of both of these reasons for discounting the alert, as an aside, was made very clear when I visited the Pearl Harbor Memorial. Conventional wisdom prior to Pearl Harbor was that Japan did not pose a major threat to the US, and would not dare to attack such a country.2 A “war scare” with Japan and the US had risen up and dissipated a few months before the actual attack, leading many to think the threat had passed, and even on the day of the attack, many soldiers and radar operators on Hawaii discounted what their own eyes saw because they thought it must be some kind of exercise, giving up any possibility of defense prior to the main attack. One of the local journalists we talked to had more plausible means to discount the alert as false: he could contact a high-enough ranking member of the Hawaii government. That’s not a bad reason to discount it (though even then, would you bet your life on this official being “in the loop?”), and much of our discussions as a group centered around what the role of journalists ought to be in such a crisis situation, if they had information that was not yet released officially. I liked this one, only because it highlights that an early-morning alert is only going to reach so many people. This was my Japanese-American (emigrated here in the 1970s from Tokyo) taxi driver who took me to the airport. I don’t have anything clever to say about his story, but I loved it so much. One more cup of coffee, if that’s what it’s going to be. One thing that emerged for me is that the narrative of “what went wrong” is still not quite known. The first draft of the story, which most people believe, is that an employee clicked the wrong button on the alert website. This is absurd enough to be believable, and the “lesson” of it is clear: user interfaces matter, a conclusion that resonated very strongly with the “human factors engineering” analysis that became very popular following its application in the post-mortem of the Three Mile Island accident. But that turns out not to be what happened, as emerged later. Two different versions have been put out. The “button pusher,” we’ll call him, later told journalists that he, in fact, had not done it accidentally, but that he had been told it was real and he believed it was real. Which turns it into a very different sort story: one about miscommunication, human error, and a system problem that makes it very easy for an alert to be sent (by a single person), but not to be rescinded. The grim irony is that Hawaii was being extremely proactive when it came to the possibility of a ballistic missile threat. They’re not wrong to think that it should be in their conception of the possible risks against them. They appear to have been one of the only statewide emergency management agencies that had worked to reintroduce nuclear weapons threats into their standard alert procedures and drills.4 They set up a system that, by any measure, contained terrible flaws, ones that any outside analyst could have seen. And we were told that a consequence of this false alarm, aside from the panic, fear, and confusion (of such magnitude that may have caused at least one heart attack), we were told, is that Hawaii seems to have put its ballistic missile alert system on an indefinite hold. Which is understandable, but unfortunate. Because the nuclear threat, including the ballistic missile threat, is still a real one. It will continue to be a real one as long as there are hostile states with nuclear-tipped ballistic missiles — which seems like it might be a very long time indeed. HI-EMA was right, I think, in making ballistic missile threats part of their “threat matrix” of possibilities that they, as the organization tasked with preserving the lives of their citizens, were tasked with addressing. But they also had a responsibility to set up a system in which false positives would be very unlikely, and they utterly failed at that. The consequence is that not only are the residents of Hawaii less prepared than they had previously been for the possibility of a nuclear attack (which if you think is so remote a risk, read Jeffrey Lewis’s novel, the The 2020 Report, and get back to me), but other state governments are probably going to continue to be shy about taking nuclear risks seriously, for fear of the terrible publicity that comes with getting it wrong. Read Alex Wellerstein’s blog here. Article reprinted with the kind permission of the author. Further background information on all the participants can be found here. More information on the Hawaii Journalism Workshop is available here and on the official Workshop page. For questions about the workshop agenda, speakers, or other details, please contact info@atomicreporters.com. Next Post A nuclear bomb might not kill you. But not knowing how to respond might.